If you’ve ever read Roald Dahl’s book Matilda, or seen the movie, you’ll know that Bruce Bogtrotter is the little boy that dared to steal a sliver of chocolate cake from his evil headmistress’s tea tray. As punishment he was forced to eat the entire enormous cake in front of the whole school assembly. I’m not sure if it was punishment or pleasure for Bruce as he seemed to do a fine job of it and much to the annoyance of the villainous headmistress, Ms Trunchball, scoffed the whole cake down while his school friends cheered him on. I’m not surprised really as the cake looked amazing. Ms Trunchball probably said it best when she declared “That was not boy’s cake! You don’t think for one minute I’m going to eat the filth I give to you? That cake was made from real butter and real cream!”. 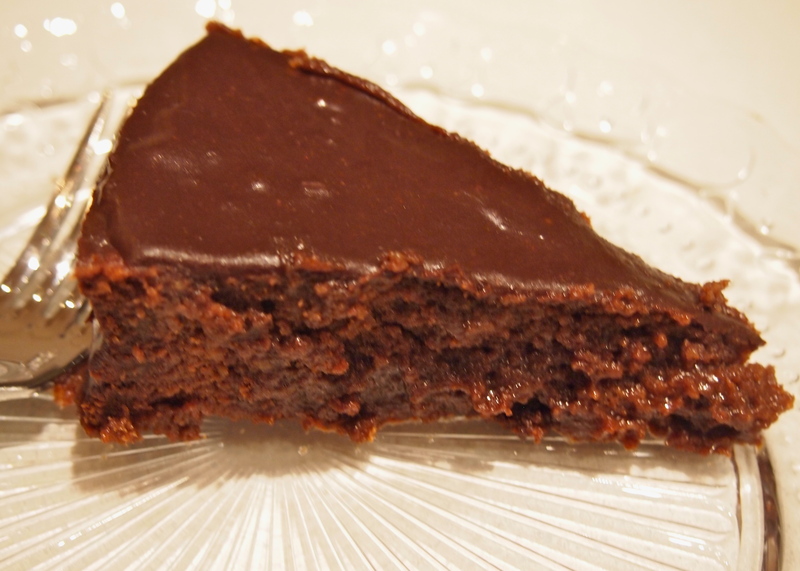 A little while ago I came across a book called Roald Dahl’s Revolting Recipes, which is a collection of recipes inspired from all his children’s books, and I was delighted to find it contained the recipe for the cake that poor Bruce Bogtrotter had to consume. I knew I had to make it and I’m so glad I did. My niece declared it one of the best chocolate cakes she’s ever had and whilst it wasn’t quite as big as Ms Trunchball’s cake I somehow knew that if I was told to consume it one sitting I might not find it such an onerous task. That being said, it’s very rich, fudgey and utterly delicious and far too good to use as punishment! Preheat the oven to 180C. Butter a 9 inch cake pan and line the bottom and sides with baking paper. Melt the chocolate in a bowl set in a saucepan of simmering water. Mix in the butter and stir until melted. Transfer to a large bowl and add the sugar, flour, and lightly beaten egg yolks. 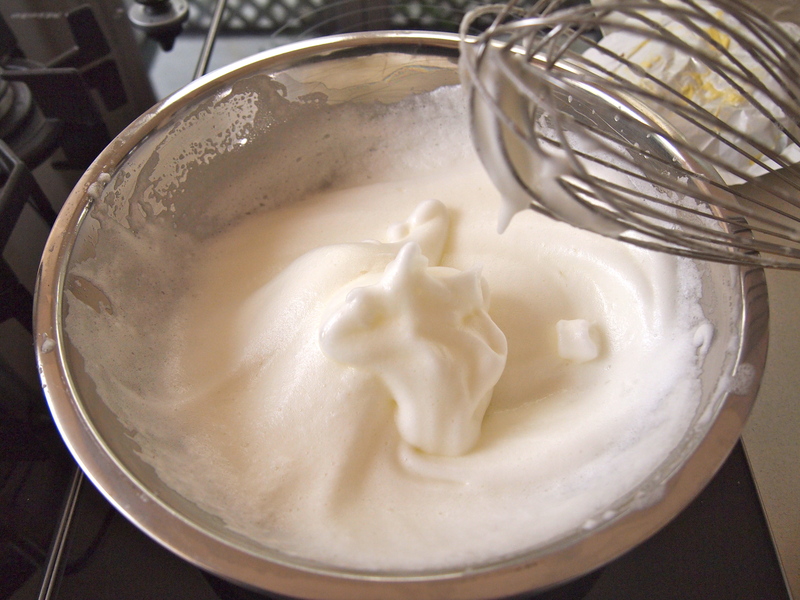 Whisk the egg whites until stiff. Gently fold half of the whites into the chocolate mixture, blending thoroughly, then fold in the remaining whites. Pour the batter into the cake pan and bake for about 35 minutes. There will be a thin crust on top of the cake, and if tested with a toothpick the inside will appear undercooked (don’t worry, the cake will get firmer as it cools). Remove from the oven, and let cool in the pan on a wire rack. While the cake is cooling, make the icing. 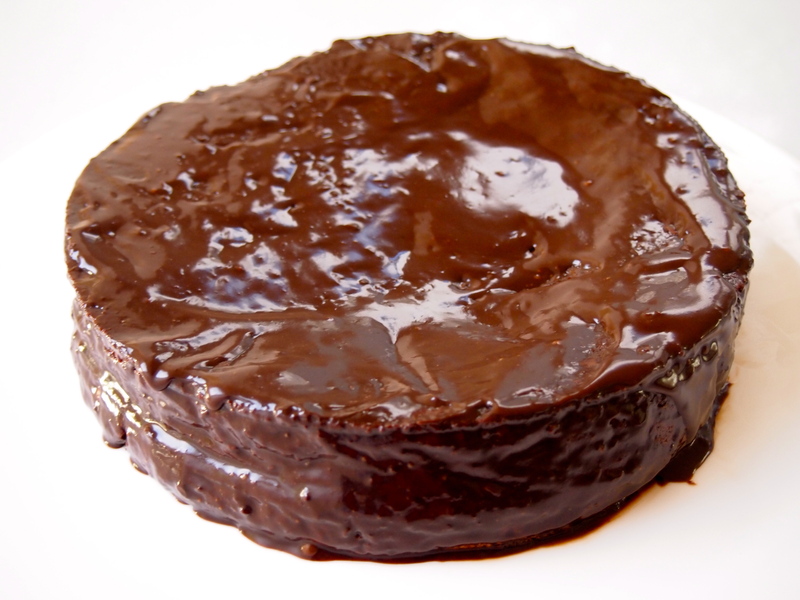 Melt the chocolate with the cream in a heavy–bottomed saucepan over lowest heat, stirring occasionally until the chocolate is fully melted and blended with the cream. Remove from heat and let cool slightly. 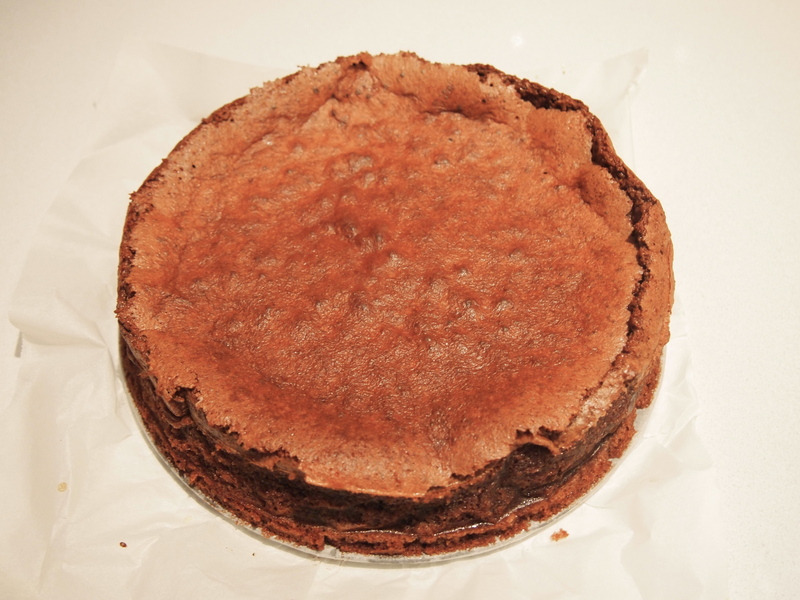 When the cake is cool enough to handle, remove it from the pan and discard the baking paper. The cake is prone to sinking slightly in the middle, so flip it upside down before icing by placing a plate on top and carefully turning over the cake pan and plate together. Carefully spread the chocolate icing all over the cake with a spatula.